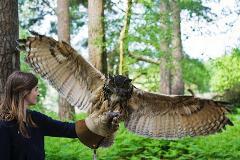 A totally Hands On experience flying some of the worlds most amazing Birds of Prey, including Hawks, Owls, Falcons and Eagles in 11 acres of exclusive woodland in the beautiful New Forest. No experience necessary. A totally Hands On experience flying some of the worlds most amazing Birds of Prey, including Hawks, Owls and Falcons in 11 acres of exclusive woodland in the beautiful New Forest. No experience necessary.